Redeem at any UK Tesco store. Excludes purchases from Tesco Petrol Stations. You can check your available balance at any Tesco Store or by calling 03450 757 757. Digital gift cards cannot be exchanged for cash or credit. The digital gift card and balance will expire five years from purchase or last digital gift card use. Treat this digital gift card like cash, lost or stolen digital gift cards cannot be replaced. Damaged, altered or cancelled digital gift cards will not be accepted. Tesco meets the day to day needs of households across the UK , as a supermarket, home store, technology retailer, fashion outlet and much more. With a Tesco Ecode, anyone can find the perfect present, no matter their style or interests. 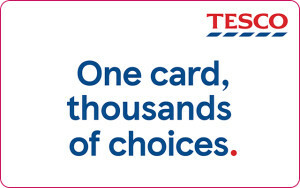 Tesco Ecodes can be used towards the purchase of thousands of products in store. From the weekly food shop to home décor and electronics, there’s enough choice to please everybody. Plus, lucky recipients have 5 years to redeem their and when they do, they’ll earn Clubcard points too - it’s enough to put a spring in anyone’s step.